Or perhaps you prefer this monumental version. If Ethel Waters and Louis Armstrong have played your song, then I think you can go on to your rest with some peace of mind. You did all right and probably did some good. Growing up, a few songwriters that pre-dated World War II dominated the music that was still being played from those days. Irving Berlin might have been the most common. George Cohan, Duke Ellington, Hoagy Carmichael, Cole Porter, and a few others were in the mix. Berlin probably gets the nod because he wrote those holiday classics which found their way into movies that became staples of life. How we forgot Fats Waller, I’ll never know. That’s not entirely true. I could guess. Listen to the music. 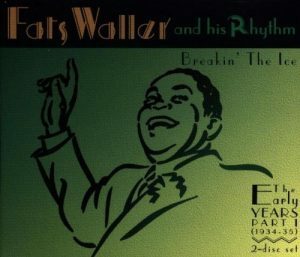 While Berlin and those others wrote any number of songs that felt timeless, something about Fats Waller has always felt modern to me. If you could take him and his work into a modern studio, something about all of it feels like it would work out just fine. I can’t explain it-maybe it’s the arrangements or the delivery or the songs themselves. Perhaps it’s the heavy reliance on blues and song structures that remain ever-present. So, here’s an interesting thought. Is the history that we are most inclined to forget the very history that we find easiest to repeat? If we think that we’re more likely to just do it again, then we merely cast aside all memory of the first go round. It’s the first step to being doomed to repeat the failures of the past, as well as the successes. Just as a pop music star’s ignorance of his predecessors grants him the freedom to replicate their discoveries, the businesses which promote the pop star have little to gain by keeping those earlier artists in our minds when more money can be made by creating a living phenomenon. Let’s call it the totalitarian principle. Maybe it applies outside of the arts, also. Dipping into history is one good way to fight the ennui engendered by that awful sense that you’ve seen this hot mess before. Another might be playing Fats Waller songs loud and often. You get an interesting reaction. The hope I carry is that we might be due for another Fats Waller revival. They seem to come around every few decades. Those other songwriters I mentioned above have had their moments back in the sun and it feels about right for Waller to have his turn. You’ve Got to Check This Out is a blog series about music, words, and all sorts of artistic matters. It started with an explanation. 182 more to go.